As a dedicated roof repair service with experience in inspecting and correcting roof problems before they threaten the entire roof structure, Mike The Roof Tune Up Guy should be your first call when you consider how to protect the investment in your home. We serve Kansas City and surrounding communities with a passion for service and excellence. Our skilled, trained, an insured roof repair technicians specialize in around the clock full service emergency roof repair. All work is completed in a timely fashion to protect and preserve your home. 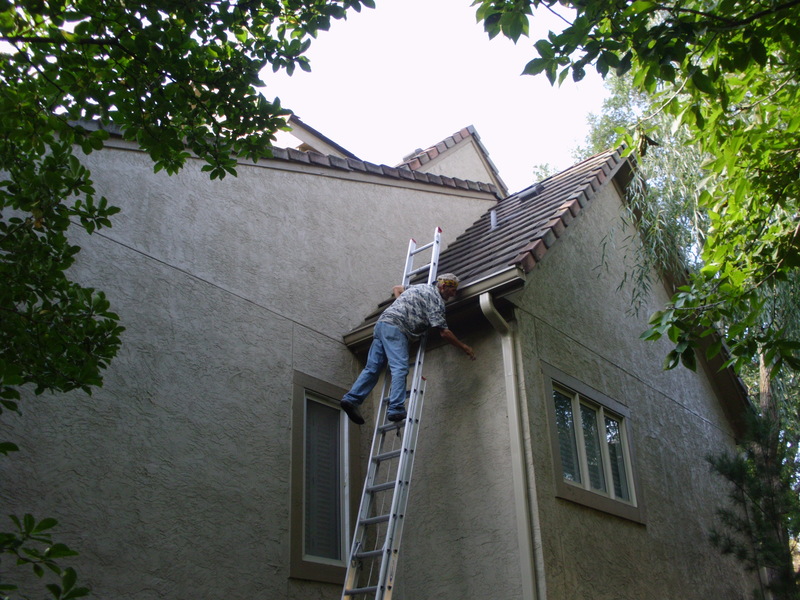 Our services include complete roof inspections and repairs from the eaves to the ridge. Timely roof repair solutions can correct minor roofing problems before they become major structural damage. We are an industry leader with innovative ways to seal potential leaks before they become threatening to the underlying structure. Avoid feeling anxious by contacting Mike The Roof Tune Up Guy today and take the steps you need to preserve and lengthen the life of your roof with an exclusive three year no-leak warranty. Why Select Mike The Roof Tune Up Guy? What sets Mike The Roof Tune Up Guy apart from the Pack? We are dedicated to proactive, cost-effective, speedy roof repair services. We are not normally in the business of replacement and will not try to sell you a new roof when our tried and true roof repair methods will work to protect your home and extend the life of your existing roof. Additionally, we pledge to provide a positive customer service experience that is focused on positive demeanor, ethical business practices, quality workmanship, and lasting commitment to the end product. We guarantee our work for three years from the date of repair every time. Mike The Roof Tune Up Guy has created an environment that promotes safety and employee moral. Each team functions as a unit that has multiple disciplines at its disposal. They are enriched with continuous training to further develop both individual and company skills all with the ultimate goal of serving the home owner with roof repairs and solutions for any roofing issue encountered. Nature is constantly trying to break down what mankind makes. Hot summer sun attacks your roof with high temperatures and UV rays. These break down the roofing materials that shed water, and when the rain comes and hits those dried out roof tars suddenly you have a roof that leaks and mold, fungus, and a myriad of costly repairs. Thankfully, a little preventive step can help against much of this. Call Mike The Roof Tune Up Guy to have your roof inspected for broken, missing, or cracked tiles or shingles. Look for exposed nails or areas where branches have scrapped the roof. Inspect the seals around vents and flashings to see if the roof tars have dried out or not. These steps can prevent insect and vermin invasions and leaks. Delay could mean costly repairs at best, or total roof system failure at worse. Sunshine may be lovely and warm to your plants, but it is deadly to your roof. Heat and UV rays both break down roofing materials with long term exposure. West and south facing roof surfaces are at the greatest risk. We all love water, until it comes through the ceiling. Rainwater can get under shingle, shakes, and tiles and from there can find its way through the protective films to the roof deck. Since most roof decking is wood, water will cause it to rot and promote mildew, not just on the roof but in walls, ceilings, insulation and electrical systems. Wind is lovely on a fine spring day, but high winds can cause significant damage to the roof. It can lift shingles and force both water and debris under them, breaking the watertight seal that should be preventing leaks. Winter brings snow to many parts of the world. Sadly, melting snow can refreeze on the overhang of the roof, creating ice dams and backing water up under the shingles where it seeps into the house. The risk of melting snow is such that gutters and downspouts are at great risk of damage. When the inside of the house is warm and damp, and the attic is not ventilated properly, the moisture can condense in the wood sheathing and rafters. This makes it more likely that the wood will decay. One way to fix this is improved attic ventilation. If you use wood shingles or shakes and live in an area that is moist, then you need to have regular inspections for moss and algae growth. Moss tends to hold down moisture and can even grow through on to the roof deck and underlying structure. The damp can promote rot. In areas that are wet even asphalt shingles are not immune to algae growth. Both types of plant growth are bad for the roof. Additionally to nature having a toll, tree branches, animals, and other threats can cause damage to the roof. If you have missing or torn shingles, you need prompt professional repair services to correct the problem before it becomes a major leak. Copyright 2016 Kansas City Roofing and Sheetmetal. All Rights Reserved.